This elusiveness of Li’s poems has been attributed to, among other factors, the intrigue of his life and times. The divisive currents of the rapidly declining Tang establishment created a perfect storm in which writing with any specificity about one’s lovers and rivals, patrons and peers (often the same people) was simply out of the question, especially for a bureaucrat struggling to get by. Chloe Garcia Roberts, the intrepid translator behind New York Review Books’ sleek new selection of Li’s poetry, describes in her introduction how Li often had to safeguard his position as a “glorified ghostwriter” for superiors of different factions and persuasions. Viewed another way, however, Li’s obscurity belies a deliberate and practiced intricacy: a product of both his encyclopaedic knowledge of Chinese cultural history (much of which has been lost to us over the centuries) and the sensuous lyricism of his poetic voice. The Purple Girl Spirit left. The bluebird delays in coming. Once again we are dispersed. Without warning, the loss gestured to in the first stanza becomes the object of the second. And though the identity of the Purple Girl Spirit remains a mystery, what matters most is experiencing the full weight of Li’s “bitterness,” especially when the fulfilment he desires is out of reach. Reading sense in tandem with—and sometimes as secondary to—sound and sight can be slow and even frustrating for those of us accustomed to more expository translations. With this sensory emphasis Garcia Roberts holds the reader at a careful distance from conventional ideas of authorial “intention,” providing a space in which meaning can shimmer into view. Not unlike the equally allusive poems of John Ashbery or Geoffrey Hill that may be more familiar to Anglophone readers, Garcia Roberts’s translations force us to accept a necessary, unbridgeable gulf between what we know and what Li knew, the specificity of his experiences forever locked away in his language. And yet, as we pore over a translated text that is brimming with suggestion, we marvel nonetheless at the beauty and complexity of Li’s worlds. The question remains, however, whether Garcia Roberts successfully recreates Li’s visual and auditory syntax. Not pursuing interpretive clarity is one thing, but it is quite another to transpose the fullness of a language as challenging and multi-dimensional as classical Chinese into an entirely alien tongue. Here, unfortunately, Garcia Roberts’s generally sound decisions regarding tone and form do not always work in her favour. 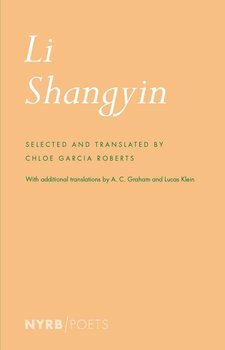 The former is a tough choice for any translator, but particularly one who also seeks fidelity to Li’s “opulent and extraordinary world,” as Garcia Roberts puts it elsewhere. In many instances, she aims to reconcile Li’s bookish manner with naturalistic modern phrasing, but English, which affords few visual and tonal possibilities compared to Chinese characters, proves unable to handle both. I dared to lightly compose. Fell into my half-drained cup. Such renegotiations of tone—between fidelity and renewal within a single poem—mean pieces like this one sing in certain stanzas but fall flat in others. An alternative approach would have been to aim for more consistency within each poem, but perhaps greater variation across the collection as a whole, to cope with the demands of Li’s moods and idioms, and to avoid such off notes. Come is a hollow word. Moon slants over building roofs. Bells of the fifth watch. The moonlight slants above the roof, already the fifth watch sounds. In this particular case, Graham’s structural choice to bridge the fault with “already” proves more successful, and leaves the reader room to imagine the buildings and bells that Garcia Roberts names explicitly. Some of her translations may have benefited likewise from a more flexible approach to their form; yet, to her credit, including alternatives in the same volume deepens our appreciation of the complexity of the task at hand. These minor complaints aside, Garcia Roberts’s translation represents an original approach to one of the most distinctive and challenging voices of the classical Chinese canon. Though not the most accessible body of work for the occasional reader of Tang poetry—and a demanding one even for the specialist—Li’s startling images and aural complexity gain new life in Garcia Roberts’s hands. The poems also arrive at an apt time: their obscurity, shaped by the political machinations of their era, resembles how political intrigue, divided loyalties and widespread upheaval play havoc with plain speech and meaning in the present. It is perhaps in grappling with their beauty and uncertainty that we might learn something of how to speak in our own complicated world. Theophilus Kwek has published five volumes of poetry, most recently The First Five Storms (2017), which won the New Poets’ Prize. He came second in the Stephen Spender Prize in 2016 for his translation of a poem by Wong Yoon Wah, and has also translated work by Sinophone writers Andy Ang and Ting Kheng Siong. He is currently based in Singapore as a writer and researcher, and his poems and essays have appeared in The Guardian, The Times Literary Supplement, the Harvard Divinity Bulletin, the Irish Examiner, and the Asian Review of Books, among other platforms. He serves as co-editor of Oxford Poetry and editor-at-large for Singapore at Asymptote.